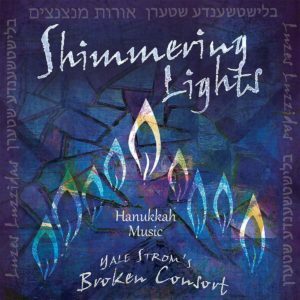 Shimmering Lights, the debut record of Yale Strom’s Broken Consort is now available from Arc Records! With this album, klezmer musician Yale Strom presents new arrangements of Hanukkah songs from around the world. Representing a multitude of styles and tongues, Shimmering Lights captures jaw-dropping musical and cultural diversity. 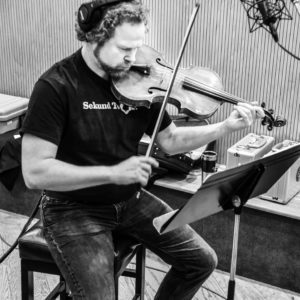 As a member of Broken Consort, I’d like to share my insider’s perspective of this exciting project and our recording sessions. When Yale Strom contacted me in February 2017 about recording a new record, I wanted in. Why? Yale is a consummate fiddler and bandleader. When he’s at the helm, you play things you didn’t know you could play. Somehow, you speak musical languages for which you previously had neither vocabulary nor fluency. Musical magic is potent stuff, folks. When I find it, I can’t get enough of it! At the core of Broken Consort is a tight quartet from Yale Strom’s klezmer band, Hot Pstromi. Seriously, these musicians perform with one mind. Guitarist Fred Benedetti and bassist Jeff Pekarek have played with Yale since their teen years. Their groove is comfortable, familiar, telepathic. With her singular voice, vocalist Elizabeth Schwartz adds a dynamic, expressive presence to all performances and truly commands the stage. 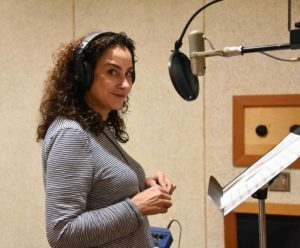 As Yale’s incredible longtime spouse and business partner, Elizabeth truly leads performances and projects in her own right. To expand Broken Consort’s scope, Yale augments his core Hot Pstromi quartet with four additional musicians. Cellist Alexander Greenbaum (Hausmann Quartet, the Knights) brings exceptional skill as a contemporary classical chamber musician. Violinist Sara Caswell (Nine Horses, Esperanza Spalding) represents the full range of jazz, combined with her virtuoso approach to classical and new acoustic music. In contrast, Amos Hoffman‘s oud and electric guitar span everything from traditional Arabic, Hebrew, and Moroccan music to jazz and rock. My job as violist is to bring my full background in Texas fiddling, psychedelic rock, free jazz, and classical. My favorite selections to perform, though, are epic jams like “Kita’l Tas” and “Maoz Tzur.” In these tracks, the band respectively begins with austere, traditional Morrocan and Sephardic settings. As the songs progress, though, we gradually expand into free-form, west-coast psychedelic jams. We musically embody Yale and Elizabeth’s vision of celebrating Hanukkah’s diversity across centuries, languages, and cultures. Each musician shines with his or her unique musicianship and voice. At the end of day one, our final task was to overdub these solos. First, Alex recorded his polyphonic cello intro and outro to perfection. Fresh off of her 2018 Grammy-nomination for “Best Improvised Jazz Solo,” Sara Caswell delivered a “one-take wonder.” In musician’s parlance, this is when someone records an incredible first take, immediately recognized as unrepeatable and unsurpassable. After her final note, Sara smiled, put down her headphones and fiddle, and fairly leapt to the control booth to listen. Next, it was my turn, but I wasn’t finding the same mojo. Because Sara’s inspired solo created such an exquisite arc and story, I couldn’t accept anything less inspired. Although Yale and Sara were supportive, encouraging, and satisfied with more than one of my takes that evening, I wasn’t. Finally, Amos interrupted: “We should go home; you’re tired. Tomorrow, you’ll knock it out first thing.” So, we wrapped up the day, and I went back to the hotel, happy from the day’s music-making, but also slightly troubled. Violist David Wallace at the “Shimmering Lights” sessions. Why wasn’t I finding it? For starters, Yale’s chord progressions are always a bit unusual. Though they seem simple, they seldom progress predictably. I needed more time to sing his underlying melodies, to let his harmonies marinate, and to explore possible pathways on my viola. I also wanted to analyze why this tune simultaneously reminded me of the Smashing Pumpkins’ “Soma” and the Andante from Johannes Brahms’s Piano Quartet in C minor, Op. 60. I composed this tone poem to evoke the strength and perseverance of the Jews who celebrated the festival of lights during the Holocaust, whether they were in Westerbork transit camp, Lodz ghetto, in a home in Bucharest, or Auschwitz. These acts of resistance demonstrated their deep commitment to religious freedom for all and their unswerving faith in the face of unspeakable horrors. While you can’t surpass a one-take wonder, you can engage it with a meaningful dialogue. Sara captured transcendence, wonder, and miraculous celestial beauty. I endeavored to respond with an earthbound strength, commitment, and faith, which perseveres amidst suffering. Recording took only five days: two to rehearse and shoot photos; two to record most everything; and one to finish, listen, and polish. After a celebratory trip to In and Out Burger, we went our ways to return to our own projects and reflect on our beautiful time together. 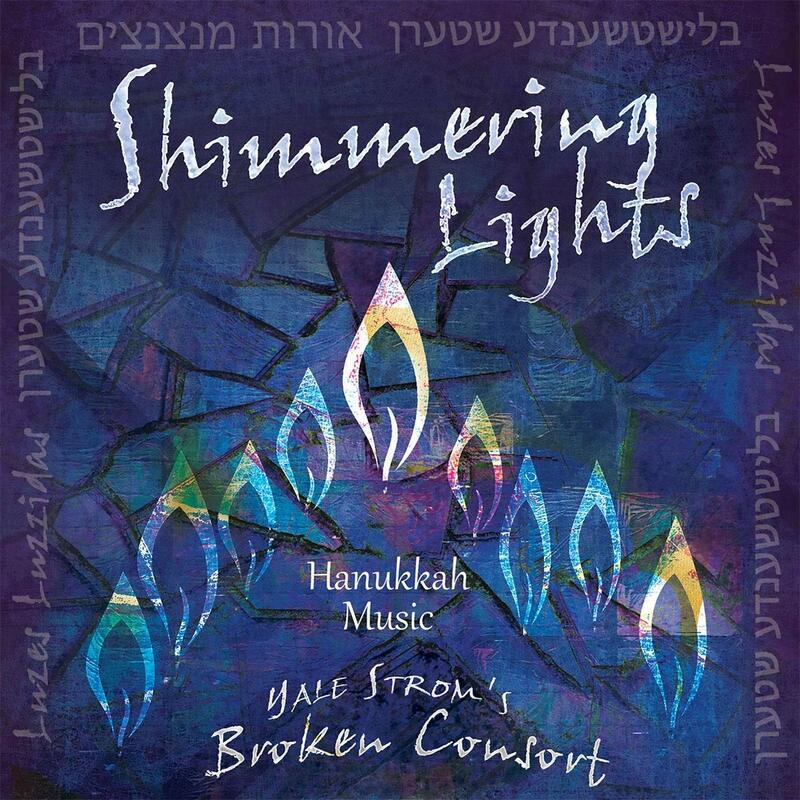 The following week, Elizabeth wrote us that “after tossing and turning,” she and Yale had named the project: “Shimmering Lights” by Yale Strom’s Broken Consort. I immediately loved the album title because the metaphor captures so many facets of the music, the band, and Hanukkah itself. A “broken consort,” is a harmonious ensemble of instruments that includes at least one or two from a different instrumental family. As I thought about the intriguing band name, I saw that like the album title, it, too, resonates in many ways. We play music of many traditions and many people. Quite a few of those traditions and songs grew out of broken people or broken circumstances. Moreover, if the musical traditions themselves have not already experienced historic breaks, certainly our band’s collective approach to the music represents just as much of a break from tradition as it does a continuation. Ultimately, we play broken music for a broken world. In the vernacular, to break from tradition usually implies that something fresh and positive is happening. A beginning. Breaking the glass at a wedding may have been intended to commemorate the destruction of the temple in Jerusalem or to demonstrate the finality of the wedding covenant, but at that climactic moment, I think most of us sense a lot more fun, joy, and possibility than we do gravity. It can be fun to break things. How about all those European traditions where they smash a whole bunch of china before a wedding? And of course there are mosaics. . . the art of assembling broken fragments to create something whole and beautiful. We don’t see the fragments. Because everything fits together to create a greater picture, we don’t perceive brokenness at all. The Gestalt prevails: the whole is greater than the sum of its parts. Yale Strom’s Broken Consort will play a free CD release concert at San Diego State University’s Smith Recital Hall at 7:00PM on Tuesday, December 4th. But you can pick up your copy of Shimmering Lights at Amazon today! A typically profound, emotional and beautiful composition; very proud to collaborate with you, Doc. I think you teach a lot more than you realize. Thank you, Elizabeth. Looking forward to giving the tunes a live spin in a couple of months!